The aircraft carrier with its associated "battle group" arguably remains today's most potent symbol of national force projection. 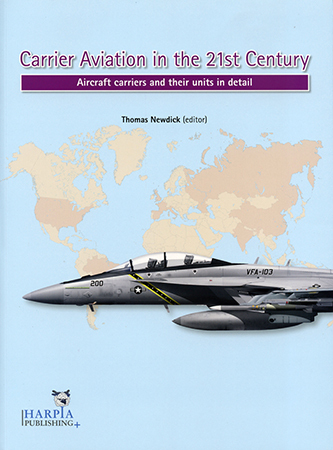 Now Harpia Publishing surveys international Carrier Aviation in the 21st Century – a lavishly illustrated, 256-page softback survey. Coverage considers, where appropriate, historical notes, combat operations, air components, seaborne units, and future fleet plans. Sections also sport dozens of color photos, unit badges, tables, and battle group schematics. And two appendices summarize ship classes and showcase world aircraft and carrier comparisons. With 20 fleet carriers and assault ships, the United States clearly dominates details. But I found parts on Brazil, India, France, and Russia most fascinating. Newdick, by the way, defines "aircraft carrier" as a vessel able "to embark fixed-wing aviation assets". He notes amphibious assault ships which could, if needed, embark fixed-wing aircraft – like Australia's Canberra-class landing "helicopter docks" and Japan's Izumo-class "helicopter destroyers". But he restricts content to current warships regularly deploying fixed-wing machines. I thoroughly enjoyed this timely, picture-packed tome. Make it your handbook on today's aircraft carrier operations.